Optional mechanical lock upgrade available. † Add 55mm to external depth for hinges and handle. Construction 10mm thick steel door with a double walled steel body filled with a special security composite. Burton	The Burton Eurovault Aver Grade 2 - Size 0K offers high security protection from theft and is tested and certified by ECB-S to EN 1143-1 Eurograde 2 standard ensuring an insurance rating of £17,500 cash or £175,000 valuables. This safe is also approved by the Association of Insurance Surveyors (AiS) and the safe door is secured with a high security double bitted key lock. The safe is constructed using a double walled steel body with a special composite security fill and additional security is provided by 3-way moving bolt work and drill protection of the locking mechanism. The bottom of the safe is pre-drilled for base fixing either on a DIY basis (bolts included) or by our own professional engineers. 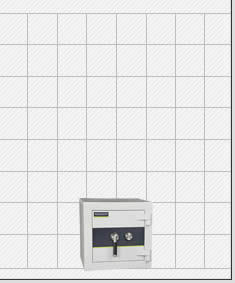 Also see 7 larger sizes available in this range or you can find all of our insurance approved safes here.